The Museum of the Bible announced Monday that five of its Dead Sea Scrolls fragments are forgeries, the result of a third-party scientific analysis. 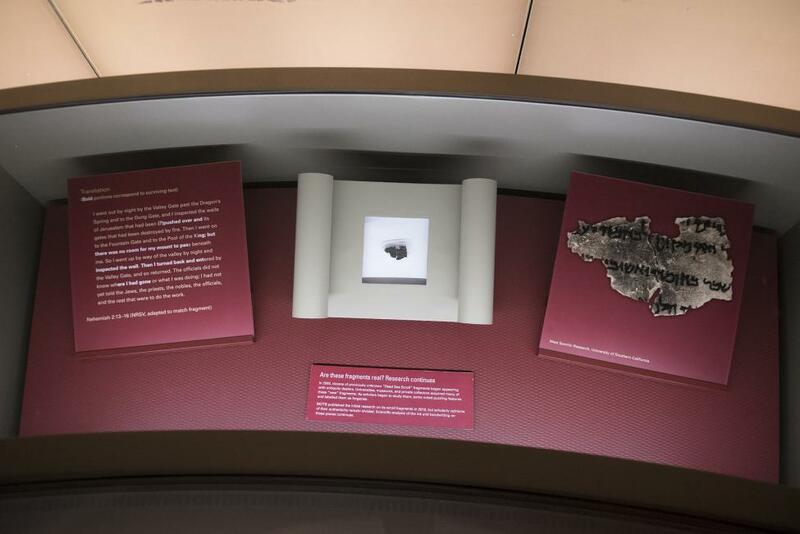 The museum, which opened in November in Washington, D.C., said it removed the fragments from display and replaced them with three other fragments also undergoing scientific analysis. "Though we had hoped the testing would render different results, this is an opportunity to educate the public on the importance of verifying the authenticity of rare biblical artifacts, the elaborate testing process undertaken and our commitment to transparency," said Jeffrey Kloha, the museum's chief curatorial officer. "As an educational institution entrusted with cultural heritage, the museum upholds and adheres to all museum and ethical guidelines on collection care, research and display." Before it opened in November, the Museum of the Bible's collection came under scrutiny by critics of the collecting practices of Hobby Lobby President Steve Green, who donated some of the exhibits at the museum. The five forged Dead Sea Scrolls fragments were among the items donated by Green, The Guardian reported. In May, Hobby Lobby returned thousands of historic artifacts from modern-day Iraq that Green purchased in Dubai and improperly brought to the United States. He paid $1.6 million for 5,500 pieces, including 4,000-year-old cuneiform tablets and stone cylinders, in 2010. The company also agreed to pay a $3 million fine. The Department of Justice found that the company had the tablets shipped to its Oklahoma headquarters, but that the boxes were labeled as containing ceramic tile samples. Green promised more oversight at the time, and blamed the incident on his own inexperience as a collector. We made mistakes, but we've learned from them," he said. "Before this, we weren't collectors or museum-goers," Green added. "We didn't know we needed to ask for all this paperwork" to prove provenance. Proving prior ownership of an artwork or artifact is meant not only to verify the authenticity of the piece, but to prevent the sale of looted items. The misstep cast doubt on the veracity of other objects the Green family owns, including some that are on display at the Museum of the Bible. Josephine Dru was the former curator of the Greens' collection of papyri; she left after three years over concerns about how the museum handled the provenance of some manuscripts. "The Greens are good people, and they wanted to find important artifacts to study, but the situation may end up hurting some of the scholars and students they wanted to help," she said in November. The museum's board also hired a cultural heritage lawyer to authenticate all items in the collection. "We feel like we're paying for the sins of the father," Trobisch said last year.